On June 5th, the French village Cappelle-En-Pévèle celebrates its 4th village festival, called "La marche des Géants". 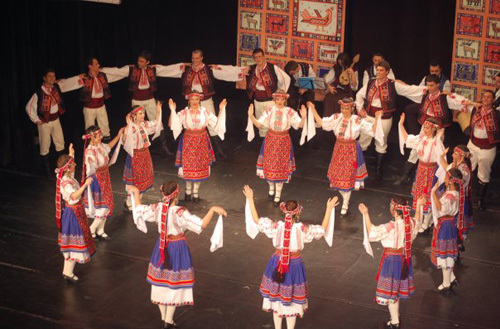 Sedianka will represent Bulgaria during this 1,2km walk and dance traditional bulgarian folk dances. The festivities start at 16h. Traditional Annual Concert of Ensemble "Balkan"
Folk Dance Ensemble "Balkan" at community centre “Tsar Boris III" is happy to invites you to its traditional annual concert. It will be held at 19:00 on 06.06.2011 in the Theatre Bulgarian Army. Also featuring are the Gadularski Chamber Orchestra at NMS "L. Pipkov” and Cultural Center "Al . Konstantinov”, the ensemble’s children groups at community center “Tsar Boris III” and 60 OU “St. St Cyril and Methodius” and other guests. Tickets can be bought from the theatre’s box office. 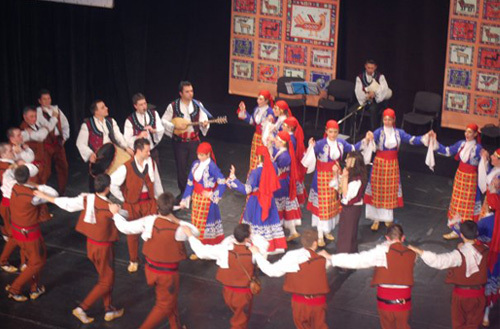 It is our great pleasure to invite you and your group to take part of the VIII International folk dance festival Budva-Montenegro” that will take place in Budva and Petrovac, from 09.06-12.06.2011.  The festival takes place in Budva, over 2500 years old town on the Adriatic coast (more information will be provided in the section “accommodation”) and Petrovac, the other city on the coast, 20 km apart from Budva. Folk groups are divided in two categories:children festival (dancers who are not older than16 years) and second for adults over 16. The number of participants is not limited. The groups will be accommodated in Budva, located 100 metars from the coast, in the tourist settlement. The rooms in the hotel are with 2, 3 or 4 beds. For participating on the festival and full board accommodation participants pay amount of totally 69 €( full pansion), or 60 € (half pansion) per person. Application form has to be fulfill and sent till the 1st of march, with payment of one pansion or half pansion (23 or 20 euros) per person ,as a guarantee of arrival in hotel,and the other part of amount after the arrival in the hotel. Groups with 50 participants get 1 full board accommodations free of charge. The groups should arrive in Budva on 09.06.2011 where they will be welcomed by a group leader and start their boarding with lunch(full pansion),or dinner for half pansion. They leave the hotel on 12.06.2011after breakfast. The organizer has right to change the program for some reason, but have duty to inform the groups for any changes in due time. Participants could extand their accommodation for more days on their account, but it is necessary to let us know. Festival will starts at 19:30 -21:00 every evening. If you accept our invitation under the above mentioned condition, please confirm your participation not later than 28th of february 2011 by e-mail (bu2folkloresho2@t-com.me) with sending application form, short history and 2 photos. Each group should pay 23 € deposit per person ,not later than 01st of march 2011 (additional information about account and depositing procedure will be send, after confirming your participation). The 30th anniversary concert of "Zornitsa" Folklore Ensemble, Sofia, Bulgaria will take place 11th June, 2011 at . The concert will be held at the National Palace of Culture on June 11th, 2011 at 7 p.m.
"Zornitsa" Folklore Ensemble was founded in 1981 by art director/choreographer Emil Genov. To this day he has dedicated his life to the ensemble which consists of young people who are intelligent, talented and devoted to Bulgarian folk dances. The repertoire consists of dances from all ethnographic regions of Bulgaria and the professional orchestra "Zornitsa" accompanies the dancers with mastery and love. The ensemble has particpated in many concerts and festivals within Bulgaria and abroad and has won many prizes. Please contact Anna Travali email annatravali@hotmail.com for information, reservations/tickets. The Festıval is open the amateur Folklore Ensembles of Dancing and Music groups with live or recorded music and for partıcıpants between the ages 10 to 30 years old.
. The festival can participate: folklore groups and ensembles for authentic folklore groups, vocal groups, folk and pop songs, bands, combinations of modern and classical ballet. 2. Age of participants - up to 17 years. - For ensembles - 40. 5. Concerts are held in four nights - 22, 23, 24 and 25 June on an open stage with dimensions 25 mx 15 m. Seats in the hall - 2100. 6. Travel expenses are borne by the participants. 7. The organizers provide package dry food for performers + 2 heads and 1 driver. 8. Groups must arrive and register no later than two hours before the concert on the day of his manifestation. - Brief information on the composition. 10. Within 31 May 2011. organizers will notify the teams on the day of participation and order of appearance. 11. The festival is not a competition. Each team received a diploma for participation and a souvenir. National Cultural Center "Bratya Grancharovi"